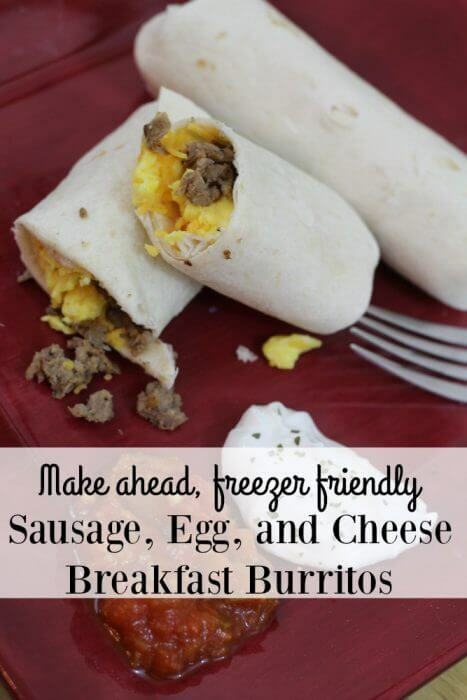 / Sausage, egg, and cheese breakfast burrito recipe that freezes well! I am SO NOT a morning person. I stumble to the coffee pot, grumbling the whole way. I pour some of the mood altering brown liquid into my cup, add a splash of creamer, and then head to my favorite spot on the couch. I enjoy some one on one time with my smartphone and slowly sip myself awake while I see what happened in the world while I slept. I don’t want to have a conversation with anyone until I have had my second cup. I usually don’t even eat breakfast. Unfortunately, most mornings I am interrupted before I am fully awake and ready to face the day by hungry man children who want to eat. How do I choose to face this harsh reality? I make sure I always have breakfast ready to go in the freezer. 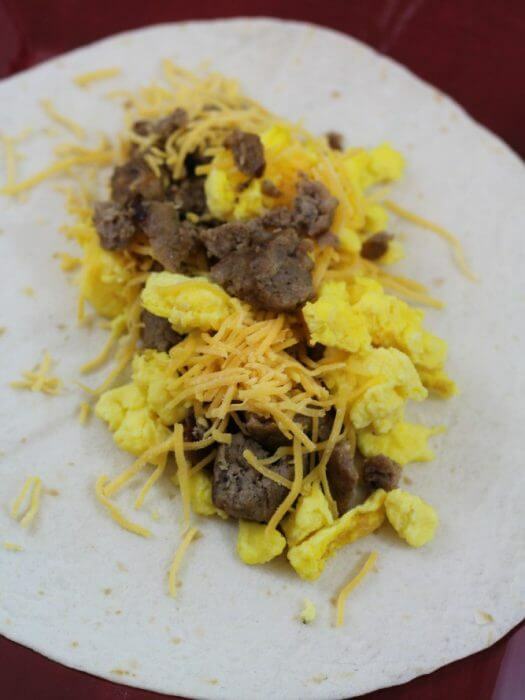 This sausage, egg, and cheese breakfast burrito recipe made with Brown ‘N Serve links is my go to make ahead breakfast. Before we jump right into the recipe I wanted to share with you that there is an Ibotta offer available for Brown ‘N Serve links. 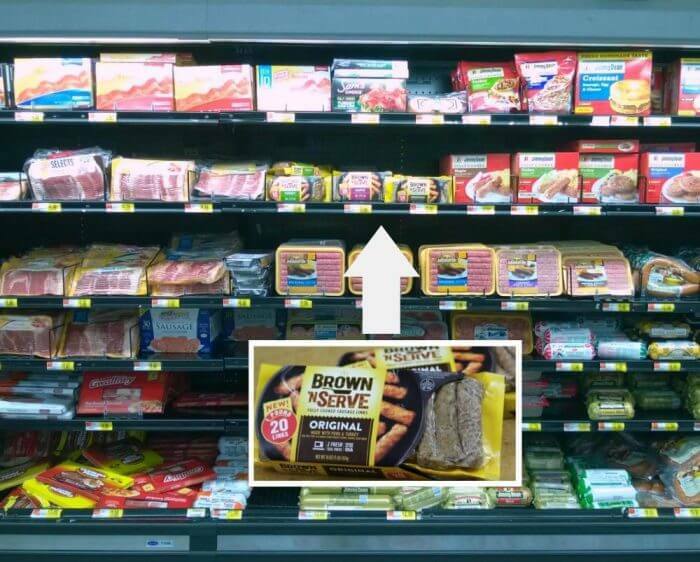 The offer is for an Ibotta rebate of $1.00 so you can save money when you shop for Brown ‘N Serve links at Walmart. Get your work area ready. You will want to create an assembly line of sorts. Put the cheese in a bowl so it is easier to scoop. Get the tortillas out and ready on a plate. Brown the Brown ‘N Serve links in a skillet. The links are fully cooked out of the package so this only takes about 3 minutes. 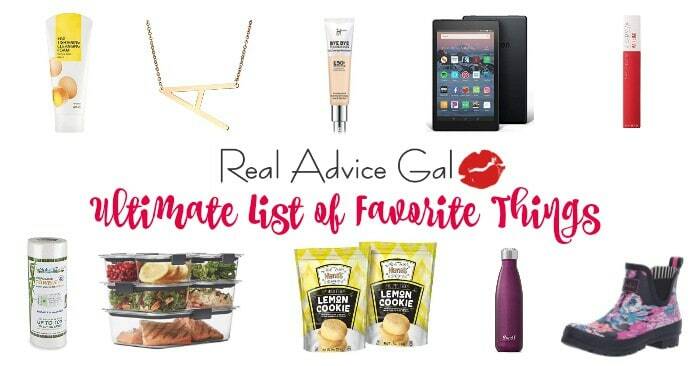 Or you can cook them in the microwave, whichever you prefer. Chop up the links and put them in a bowl. Scramble and cook the eggs and transfer to a bowl. 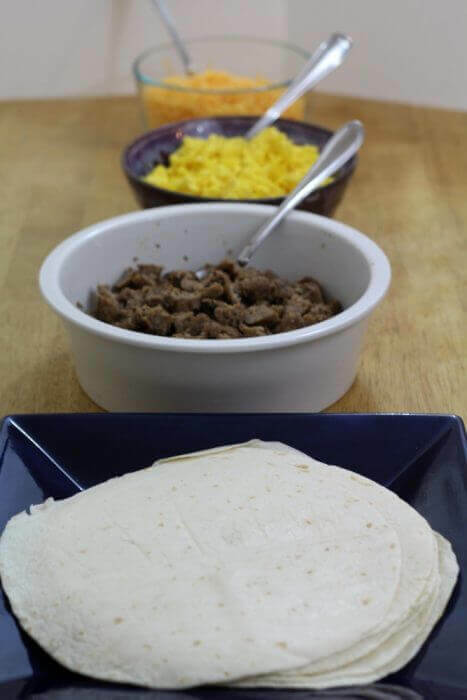 Now that you have all the ingredients prepared you can start assembling the burritos. I just have one family member each man a station. My 5 year old scoops the cheese. My 10 year old scoops the eggs and sausage. And my husband who worked at Taco Bell during college is in charge of folding the burritos. We usually have these burritos for dinner the night we make them and also make extra for the freezer. 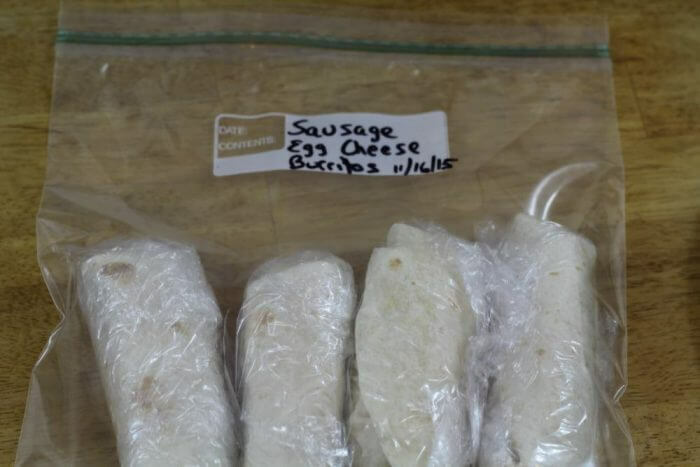 To reheat the frozen burritos you just cook them in the microwave for 1 minute. We usually make between 50-60 burritos at a time. Why not make a bunch of them since the freeze well and can go directly from the freezer to the microwave. This way my husband can take them to work and and have a hot breakfast when he gets to work. My children can fix their own hot breakfast since they know how to work the microwave. And in a pinch dinner is ready because we can have breakfast burritos for dinner. Brown ‘N Serve links are protein-packed so all I have to do is add some fresh fruit or a salad and dinner is done. 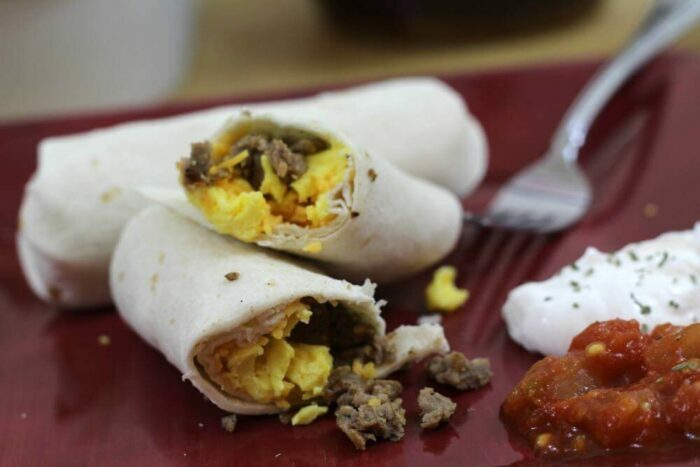 Double, triple, or quadruple this sausage, egg, and cheese breakfast burrito recipe and get ready for a fun night of burrito making with the whole family. 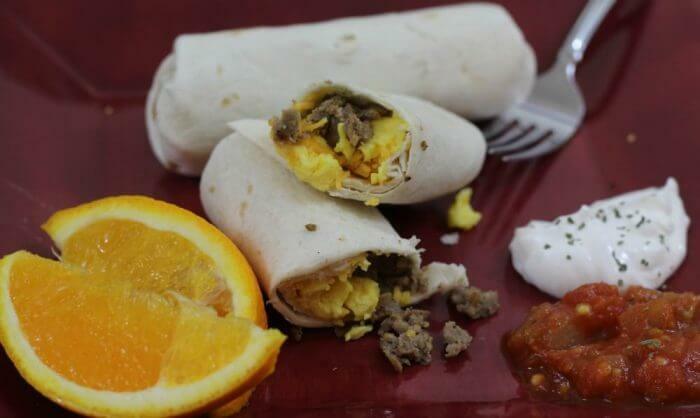 Are you ready for this bonus benefit of having your kids help you make these burritos? Guess what, they now know how easy it is to make Brown ‘N Serve links on their own in the microwave. And they may even decide to make some for themselves for lunch. Yesss!!! 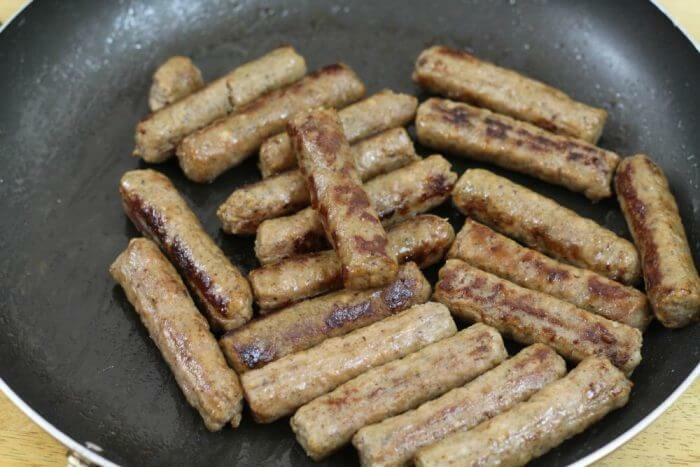 Don’t forget to take advantage of the Ibotta rebate offer when you head out to grab some Brown ‘N Serve sausage links for your favorite anytime sausage recipes. Got Mulberries? 3 Mulberry Recipe Ideas!